Lauren Moir was born and raised in Rapid City, SD. Once she graduated high school, she moved to Seattle, WA and attended Le Cordon Bleu College of Culinary Arts. There she graduated with a certificate in Patisserie and Baking and started off her carrier as the head pastry chef at Salty's Seafood Restaurant. Working there gave her the confidence she needed to venture out on her own where she gained the experience in managing, plating and creating recipes. After 3 years she and her husband moved closer to home in Sioux Falls, SD. There she became the morning baker at the prestigious CH Patisserie. Lauren gained knowledge in prepping and baking techniques along with experience in customer service. It wasn't home though, so they decided return to Rapid City. Once here, she realized her passion was to open her own bakery. Lauren accomplished that dream in August 2017 by opening Pistachio Pie. Her grandmothers love of baking was her inspiration and she even uses some of her recipes in the shop. 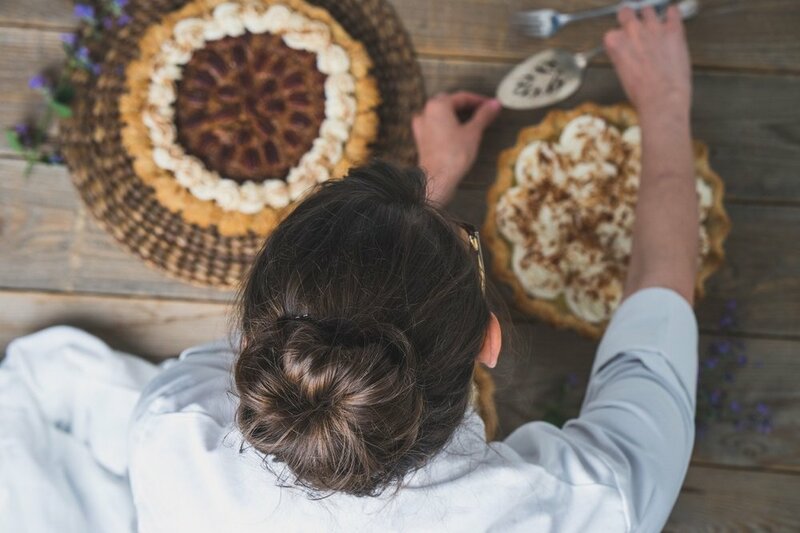 While the bakery does specialize in pie, her menu is always expanding. Look to the menu page to see everything she offers.